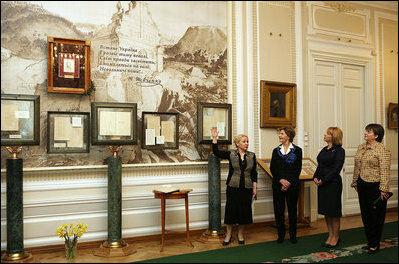 Mrs. Laura Bush, Mrs. Kateryna Yushchenko and Dr. Deborah Taylor, wife of U.S. Ambassador to Ukraine Bill Taylor, tour the Taras Shevchenko National Museum in Kyiv Tuesday, April 1, 2008. The museum honors the great Ukrainian poet, artist and thinker who died in 1861 at the age of 47 after spending 10 years in exile for his opposition to the social and national oppression of the Ukrainian people.